There aren’t many places where people are faced with as many different product choices as they are at the supermarket. Now, most of us aren’t in charge of selling Funions or Hot Pockets, but a lot of us are in charge of helping people navigate product lines. Whether you’re an HR director trying to help your employees choose the right insurance plan or a marketing manager trying to move more televisions, understanding the way people react to product choices can make or break your next campaign. 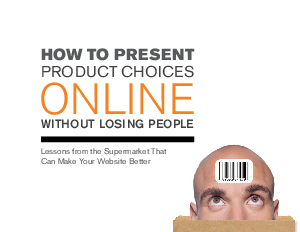 Over the course of this eBook, we’ll use our friendly neighborhood supermarket to explore three major pieces of scientific research that can help you better understand how the way product choices are presented impact people’s brains and behavior.